The inaugural Mountain Bird Festival received recognition in the May 2014 edition of the Birding Community e-Bulletin, a widely distributed email newsletter concerning birds, birding, and bird conservation. The Birding Community e-Bulletin is coedited by Paul Baicich and Wayne Petersen. The Mountain Bird Festival also received similar recognition in the April edition of The Birding Wire news bulletin. Klamath Bird Observatory’s conservation-focused festival received this attention for being the first festival to provide every attendee with a federal Migratory Bird Hunting and Conservation [Duck] Stamp. 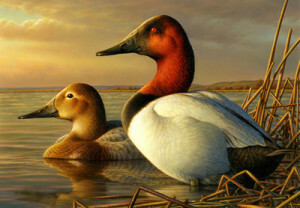 Proceeds from “Duck Stamp” sales directly support strategic wetland habitat conservation through the US National Wildlife Refuge program. Click here to read the Birding Community e-Bulletin write-up about the Mountain Bird Festival. Click here to read The Birding Wire write-up about the Mountain Bird Festival.